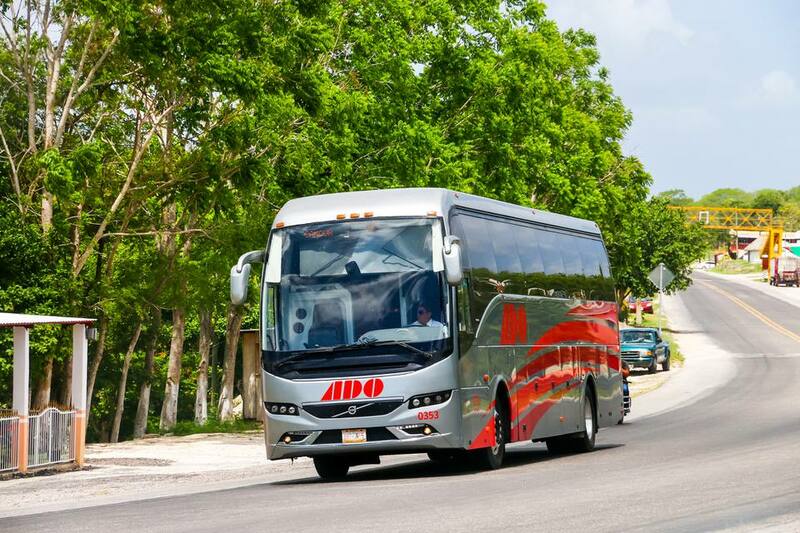 Bus travel in Mexico is generally efficient, economical and comfortable. The main consideration when contemplating getting around by bus is the great distances involved. If you're planning to cover a lot of ground, you may be better off traveling by air. Mexico is a big country and it's not a good use of your time to spend a large portion of your trip sitting on a bus - although the landscapes are beautiful! Driving yourself will give you more flexibility, but may also entail some hazards; find out more about driving in Mexico. There are several different classes of bus service that run from luxury coaches with reclining seats, air conditioning, video screens and wifi, to the "chicken buses" that are often retired Bluebird school buses painted in cheerful colors. Here's a closer look at those different levels of service and what you can expect in each. Luxury "De Lujo" or "Ejecutivo"
This is the highest level of service, offering all the comforts of first class, plus some added amenities. In some cases, the seats recline fully, and there may only be three seats across instead of the usual four. Refreshments may be served. Often you will have the choice of listening to the video through headphones instead of being forced to listen to it as is the case on most first-class buses. These buses have air-conditioning and reclining seats. Many show videos and have a toilet at the back of the bus. These generally provide non-stop service on federal toll highways where available. They offer transportation to popular destinations and cities but generally do not offer service to small towns. In some cases, second-class buses depart from a different bus station than first-class buses. Some offer direct or express service, but they generally will stop when flagged to pick up and drop off passengers along the route. There are generally no reserved seats and when the bus is crowded, some passengers may ride standing up. Second class bus service offers transportation to villages and destinations that first class buses don't always cover, and may be a good choice for short trips. Second-class buses are more colorful, drivers often decorate the front of their buses, and vendors may get on and off. Riding on second class buses can offer you a glimpse into the life of poorer Mexicans and yes, it's possible that your seat buddy may be carrying a chicken. Different bus lines serve different geographical areas and offer varying levels of service. Comfortable "ejecutivo" class buses serving central/northern Mexico. Connects Mexico City with the Pacific coast (Ixtapa, Acapulco), as well as serving Cuernavaca and Taxco. Serves northern and central Mexico. On weekends and holidays, it's a good idea to buy your ticket a few days in advance because the buses may fill up on those dates, as Mexicans take advantage of time off to travel. 48 hours in advance is usually sufficient. Buying your ticket in advance means your spot is reserved, and you can usually choose your seat. The person selling you the ticket will show you a graph of the bus You will want to avoid sitting at the very back if there are toilet facilities, so you can avoid the smell. And if there are TV screens, take that into account when choosing your spot too. When purchasing your ticket, you will often be asked your name. If your name is non-Hispanic it may be helpful to have it written down so you can just show it to the ticket salesperson instead of spelling it out. Air-conditioning is sometimes excessively cold on buses, so be sure to take a sweater on board with you, and maybe some extra socks. Occasionally the air-conditioning breaks down, so it's a good idea to wear layers that you can remove. For long trips, don't forget to take food and water with you. Stops can be short, and few and far between. In the past, videos shown on long-distance buses were incredibly bad and/or violent B-movies from the United States. This seems to be changing a bit and there is now a greater range of movies being shown. Most towns have one main bus terminal, but some may have different terminals for second and first-class buses. Since it's such a major hub, Mexico City has four different bus terminals which serve different destinations and regions throughout the country. Check our guide to Mexico City bus stations. Learn about all the different modes of transportation in Mexico.